When I’m walking down the restaurant-filled Rambla Catalunya and just casually looking at the outdoor tables, it’s fairly obvious who the tourists are. It’s not necessarily because of their large cameras or white sneakers. It’s mainly because it’s 5:00pm on a cool autumn day, and there’s a large pitcher of ice-filled sangría on the table. Now, I’m not against anyone getting a little toasty. But if you want to know how and when to do it like the locals, here’s are my suggestions on how it’s done. 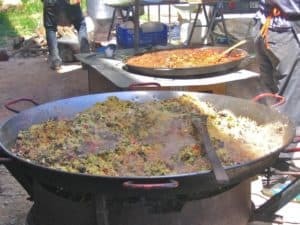 What about typical Spanish food? El desayuno. Bars serving breakfast usually open their doors by 7am. While Americans consider this meal to be the most important meal of the day, Spaniards prefer a lighter alternative. Spaniards usually wake up to have a slice of baguette bread split lengthwise, smothered with olive oil, tomato, and ham. Or for something sweet, some have a pastry like a croissant or a magdalena, a muffin with a hint of lemon. Called el almuerzo, this quick meal is had between 10am and 12pm. I’ve heard it called el desayuno (also) maybe because it may be because it’s the first meal of the day for many at this time. This can be even coffee, freshly squeezed orange juice, and a pastry, or a small savory ham sandwich. They call this meal la comida, which is the heaviest, most important meal of the day. 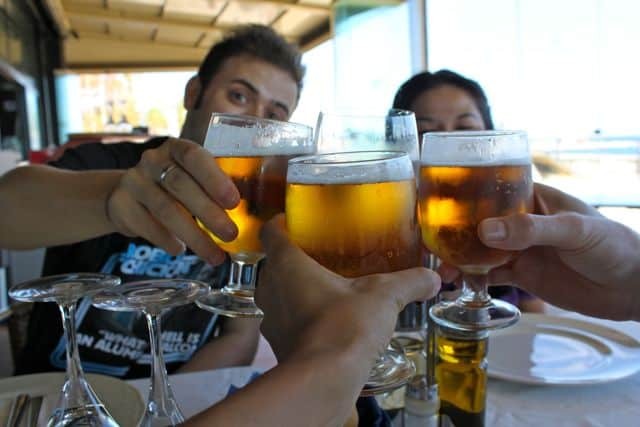 It seems 2:00pm is the prime time for eating as most bars and restaurants in Barcelona on the weekends fill up. But lunch can be anytime from 1:30pm to 3:30pm. Some restaurants are strict about these times and close off the kitchen at 4pm. The first course is a light dish like pasta, a soup, or even a cold gazpacho on a hot day. The second course is heart of the meal. It’s the heaviest course which can include beef, pork, or some hearty bean stew like garbanzos or lentils. The third course is dessert. It doesn’t have to be a fancy flan or crema catalana (similar to a creme brulee) unless you’re at a restaurant. At home, fresh fruit is almost always an option. Spaniards loooove their yogurt too (just check out their supermarket aisle), as it also aids in digestion. The merienda is consumed around 4:30pm-5pm, but I don’t think too many adults take advantage of this meal on weekdays. Like breakfast or the mid-morning snack, some might have some coffee or a pastry. For kids, it can be a Nutella sandwich or some cookies, or for older kids, the ubiquitous ham sandwich. La cena is eaten around 9pm but can be even later in the summertime. The food is much lighter since bedtime is just a few hours afterward. 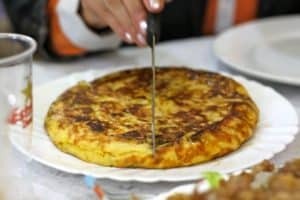 It can include fish or a tortilla de patatas (omelet with potatoes). Beef, pork, and bean dishes are rarely eaten this late. If so, you’re usually doing it on a “going out” night at a restaurant. You’ve got to top it off with fruit or yogurt of course! Having tapas is a way to relax and enjoy, so often it is reserved for the weekend. (Or a weekday if you’re single, I think.) It’s a social ritual among Spaniards and is often done around 8pm. Spanish people love to gather around a table and consume these small dishes served in small portions. They can be some patatas bravas (Fried potatoes served with a spicy cream sauce), slices of Iberian ham, or some calamares (crispy rings of battered squid). They are normally priced fairly cheap. One thing that happens is that with some tapas, everyone’s fork gets dipped into the same little dish. I had to get over that. Double dippers, welcome! The iconic tortilla de patatas, a great appetizer. This tomato-based cold soup is most often eaten during those hot summer days to cool down. Some people drink it in a cup as an accompaniment to their lunch. It can even be a first course mopped up with some crusty baguette bread. Me, I like to break my bread up in tiny pieces, throw it in the bowl, let it soak, and spoon that deliciousness right up. Yum! It’s a warming tradition to share the paella from the huge round dish in which it’s cooked and served. This hearty rice dish is often served on Sundays for lunch with the family, but you can find it on the menu on Saturdays too. It’s often also on the restaurant menu on Thursdays (at least here in Barcelona). Paella to serve 43 of your closest friends. This fruit-laden red wine drink tastes great on a hot summer day as a refresher during a lunch meal. It’s also prepared as a fun cocktail drink to share at a party at home. It’s not drunk at all hours of the day..but I know you have to try it, so plase do! 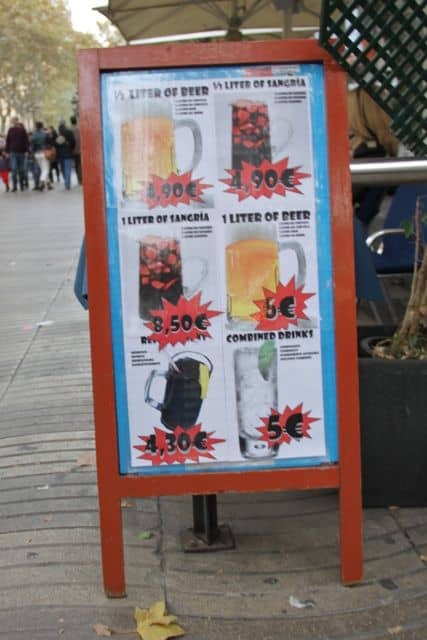 There is no such thing as an insulated coffee travel mug in Spain. Coffee is meant to be enjoyed at a table in a ceramic cup. It’s often served as café con leche, a strong coffee with frothy milk. 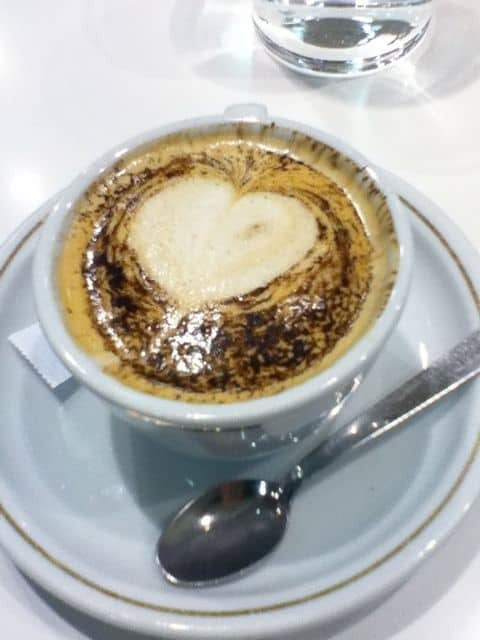 After lunch, people often sip the more concentrated café cortado, a smaller espresso and a small amount of frothy milk. Now you’ll never show up hungry to a restaurant in Spain only to find closed doors. Surely this is not an exhaustive list. Any other tips I missed? Me encanta la experiencia de Latitude 41. Justine es una buenísima conocedora de Barcelona.